KIEV, Ukraine -- For more than two months, Ivan Rapovyi’s wife forbade him to go to Maidan, the Kiev square protesters called their “island of freedom” as they sought to rid Ukraine of Russian-backed president Viktor Yanukovich and his allies. A photographs of Volodymyr Topiy (L) at memorials at Kiev’s Maidan Square to more than 100 protesters killed during 2014 anti-government protests. “We agreed that I’d only go if there was trouble,” recalled Rapovyi (37), a father-of-two from Lviv in western Ukraine, which was a bastion of the anti-Yanukovich ire that had sparked mass protests in November 2013. Two years ago today, Rapovyi finally found himself on Maidan, and facing more trouble than he had ever imagined. The turning point had come two days earlier, on February 18th, when tension that had seethed since the first demonstrators were killed by police bullets on January 22nd exploded into brutal running battles through central Kiev. “I called my friend and asked what he was doing. He told me he was watching Maidan on television, and crying,” Rapovyi said. More than 25 demonstrators and 10 police officers were killed in scenes that horrified people across Ukraine and the world, and prompted Rapovyi to leave Lviv for Maidan. Rallies had begun when Yanukovich had at the last moment rejected a historic partnership deal with the European Union, and on February 20th a truce had been called to allow for talks brokered by visiting envoys from the bloc. Fire two days earlier had devoured many tents on Maidan, and engulfed the adjacent trade union building that had served as the protest headquarters, leaving its blackened ruin to glower over a smaller but more determined and radical camp. Rapovyi woke to a scene that was still new to him: barricades of tyres burned, and smashed bricks and paving stones sat in piles waiting to be hurled, alongside boxes of rag-topped petrol bombs. Volunteers still made sandwiches and soup for protesters, but the energy that for months had fuelled speeches and songs, and created everything from a chapel to a library and a “university” on Maidan, now fed a kind of grim defiance. The February 20th “truce” barely held until 9am. Like all the protesters, Rapovyi had little protection – only a homemade metal shield. As he helped another wounded protester on Institutska Street a bullet tore through the shield and into his chest. “I rolled behind a big concrete plant pot, and couldn’t move for a long time because of the shooting. Volunteers finally carried Rapovyi to the nearby Hotel Ukraina, where a field hospital in the lobby was filling up with the dead, dying and wounded. The doctor thought he had been shot through the heart, and would die in minutes. When he didn’t, he was taken to hospital. The bullet had missed his heart by centimeters. Soon dozens of bodies lay beside Maidan and in the grounds of the nearby St Michael’s cathedral, covered with blankets and Ukrainian flags. By the end of the day, Kiev’s hospitals were treating hundreds of wounded, and the city’s morgues had taken in the bodies of more than 50 protesters and several police officers. Fire victim Volodymyr Topiy, from the village of Vyshnya close to Lviv, was identified from scraps of clothing on his charred remains, and by DNA analysis. “The men from the village wouldn’t take him to Maidan, because he had problems with his blood pressure,” said Topiy’s daughter, Oksana. “But no one could stop him going, and in December he went there alone. He came from a family of real Ukrainian patriots, and always told us that truth, honour and justice were the most important things. 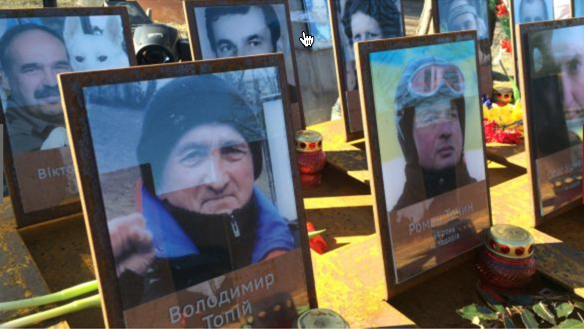 Topiy (58) died fighting the fire in the trade union building beside Maidan. Two years on, she shares the disappointment of millions of Ukrainians with the way the country is being run – big businessmen still pull the strings of weak and corrupt politicians, and the justice system remains dysfunctional. No one has been jailed for the killing of more than 100 protesters in 2014, dozens of suspects have fled to Russia, and the Kiev government’s failure to present a full picture of the Maidan’s deadliest days has fostered conspiracy theories. Yanukovich and his entourage were given refuge by Russia, which annexed Crimea and began to foment a separatist uprising in eastern Ukraine that has killed more than 9,200 people and driven more than 2 million from their homes. Rapovyi urged Ukrainians to be patient.